Saturday Pet Blogger Hop 4-30-2011 - It Was Such A Beautiful Day On Bluebird Farm Today - Time to Mow And Play! Lexi, Nitro, Tallulah, Bailey and I are excited to participate in this week's Saturday Pet Blogger Hop. Special thanks goes out to our Pet Blog Hop hosts, Life With Dogs, Two Little Cavaliers, and Confessions of the Plume! Since we've had so many storms with lots of rain this week, it was time for my husband to mow all the pastures and time for me to watch the dogs play in the back yard. Nitro got to run wild today with no supervision (he broke his toe and for eight weeks he was attached to me but this weekend he finally was allowed off leash). I was worried about Nitro being to rough with the other dogs since he hadn't played much in eight weeks plus the fact he had gotten so big. I also had major concerns about Nitro playing with Tallulah because she is only eight pounds. Bailey was another matter all together. I thought she might get in a scuffle with Nitro if he was to "in her face" with his barking. But after a few hours of roughhousing, they all seemed to play together nicely and in fact they collapsed on the outside lounger (together) which made all my fears vanish into thin air. Below are some fun photos taken today on Bluebird Farm. Not only was my husband Chris mowing but also the neighbors were out mowing across the road (notice the two orance dots in the back ground). I got a chance to plant some flowers yesterday and get my hanging baskets done. Here is a photo looking out my side porch door towards the front pasture. Whenever Nitro plays with my pughuahua Tallulah he "stalks" her. He gets low to the ground and goes very slowly and then pounces on her. Some day soon I will get a video of them stalking each other. It is so cute to watch them acting like lions after wild prey. I think something came loose....silly Tallulah! Notice the grass finally coming in all over the back yard? Six weeks ago this back yard was nothing but a mud pit! Could Tallulah be more perfect? Okay, I know I am biased when it comes to Tallulah but really, don't you think she is perfect? In this shot I imagine Tallulah saying "I love you man!" Bailey putting up with her little brother Nitro (she is an angel to put up with his crazy antics). Wonderful Wednesday! - Nitro With Chicks, Chicks And More Chicks! A few weeks ago Nitro, Chris and I went to the German Shepherd Rescue of NC Adopt-A-Day at our local Tractor Supply Co store to see all the pretty German Shepherd Dogs and to drop off a donation to the rescue. There was some beautiful black puppies that looked to be about three months old. We also noticed a lot of local Shepherd owners stopped by to visit, check out potential adoptees and give a donation with thier German Shepherds in tow. The German Shepherd rescue set up a photo booth where anyone could have their photo taken with thier dog (for a cash donation). Folks were lining up to have thier photos taken but I have to say the most popular area in the store was the big litter of Black German Shepherd mix puppies that were up for adoption. The GSR had a great turn out and Nitro got to meet new friends and also see all the new chicks. No not chicks of the female German Shepherd variety but of the poultry persuasion. They had new sets of baby chickens and ducklings under heat lamps in big metal watering troughs. They were all so adorable. Check out are photos at Tractor Supply. Nitro always paying attention to his mommy for direction - such a good boy! Check out these big beautiful black shepherd mix puppies looking for "furever" homes. Even the store employees couldn't stay away from those cute little pups. It's like they are rushing in and saying..."no, no,...pick me...pick me!" Chicks, chicks and more chicks ...oh my! I wish I had a big safe pond where I could raise some ducks (we have lots of foxes here in the farm so they would not be safe)! These little yellow chicks will grow up to be big white Leghorn Chickens. These sure remind me of when I was a child. We had a little store called The Corner Store in Nebraska and at Easter time the chicks would be sprayed all different colors (with food coloring) and one year my mom got us some chicks. They grew from really small and cute to really big and ugly. When they got big, we gave them to the farmer up the road. Sorry, the cowgirl in me had to share these boot photos! I love these hot pink farm muck boots! I wear my cowgirl hat about 80% of the time in the summer months so I had to include this photo of CEC hats (Cheif Executive Cowchick). Nitro just watching everything (this photo was taken right before his wrappings came off his injured paw). Happy Wonderful Over The Hump Wednesday! 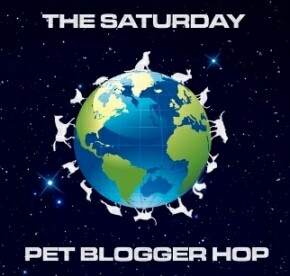 Saturday Pet Blogger Hop 4-23-2011 - Time To Celebrate Nitro's Full Recover - Time for Turquoise! 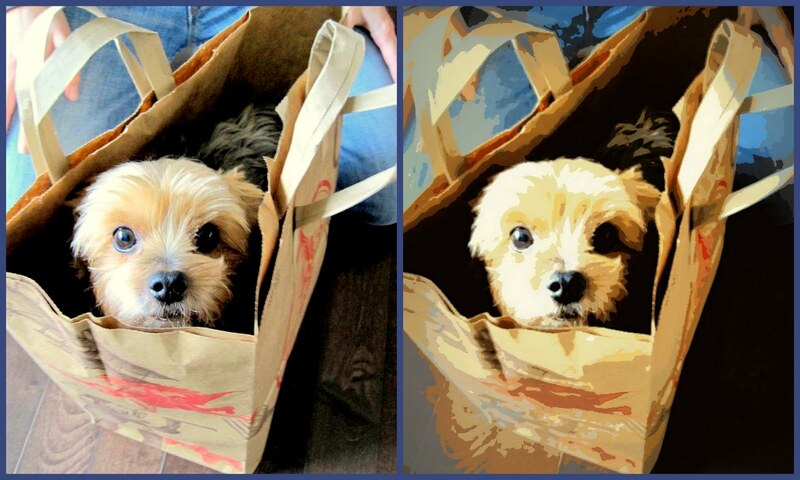 Lexi, Nitro and I are excited to participate in this week's Saturday Pet Blogger Hop. Special thanks goes out to our Pet Blog Hop hosts, Life With Dogs, Two Little Cavaliers and Confessions of the Plume! Nitro My little Blue Bunny Wabbit! I can honestly say it's been a hard road for Nitro and I. Eight weeks ago he broke his toe (at the age of six months) and this week was his first week off leash. What that means to us is we both gained our freedom back. I think this particular situation has taught Nitro and I a lot about patience. I also feel having a six month old deaf boxer attached to me 24/7 for eight weeks is not my idea of fun and I know it's been challenging for Nitro. At the end of eight weeks we were physically and mentally exhausted. In the mean time, we kept up with his training for his CGC certification and we made it through three weeks of trick's class. To celebrate this new found freedom I actually got some projects done around Bluebird Farm. My first project was to paint my old antique wicker porch furniture turquoise. I was so excited that I rushed out and purchased six cans of turquoise spray paint at Lowes. It is amazing what a farm girl can do with six cans of turquoise spray paint (and no dog attached to her every move). The photo above and the following photos are of my finished porch furniture project. I absolutely love this color. I purchased this wicker furniture for $ 30 at a yard sale about six years ago. With the new paint job this wicker set looks brand new (in an antique sort of way). I also decided to paint my old antique bench to match the wicker set. I think the whole project turned out perfectly. Here is a photo of Nitro hanging out on the porch enjoying his new found freedom. One week after I painted the porch furniture the funniest thing happened. You know those stinky old stink bugs we all hate because they never go away? Well, guess what? I am sitting out on the porch with Nitro and right before my eyes I spot a turquoise stink bug crawling across the porch. I laughed so hard because what I was seeing for the first time in my life was a turquoise stink bug or as I call him a Turquomopha halys or the turquoise marmorated stink bug (see Halyomorpha halys - brown marmorated stink bug). I think I have found a new species! Do you suppose there is some grant money somewhere to do research on this new stink bug species? It looks as though I painted over his eyes. What a funny looking little fellow! Here he is in my hand and it looks like he is shaking his tiny little fist at me saying something like "See what you did to me? I will get you back my pretty!" I felt sorry for him so I ended up setting him in my flower arrangement so he could eat and drink (kind of crazy right?). I threw this photo in because the first day Nitro was off leash he had a crazed look in his eye. See what I mean? I'm getting ready for the The Pet Expo 2011 at the Roanoke Civic Center and I am putting together twenty or so necklaces to sell to dog/cat/horse lovers. The above photo is my dog necklace with a photo in the frame of my pughuahua Tallulah. The pet necklaces that I will be offering at the Pet Expo will all have a nice photo frame hanging from them and each necklace is different. I like to layer my necklaces with silver and turquoise colors (as you can see from this photo). I will also have some stretch canvas prints for sale of my dog and horse photography. This is my Blue Bunny! Below are photos of Nitro in his turquoise bunny ears. He looks like a very tired bunny wabbit! The turquoise blue bunny ears bring out the color blue in his right eye don't you think? Time for the Easter Bunny to come and get his ears back! Above: Photo of one of our House Finches building a next into my front door wreath. My pair of House Finches built a nest in my front door wreath so I took it down before they laid any eggs because I want to use my front door and my front porch this year (last year they had babies on the front porch so we couldn't go out on the porch until all the babies were gone). I had to tear apart the little nest and I decided to leave the nesting materials so they could rebuild faster and lay thier eggs. I set the materials along my front porch railing. Well sure enough they took the twigs, horse hair, dog toy stuffing and built a new nest in our little tree in the front yard. Unfortunately that particular tree was to small and it was not a good place to build a nest. When I went to check on the nest in the afternoon, some critter had knocked it to the ground. I guess the pair will have to rebuild again. This time the nest is going into my horse hair nest collection. I have about a dozen nests and I love to collect them because they are made from the tail hairs of my beloved horses. Below is a photo of the nest yesterday before it was knocked to the ground (the egg was broken when it fell). Notice the white horse hair from my 27 year old Appaloosa mare inside the nest? The egg is a beautiful blue color. This particular color blue is my all time favorite color. I call it Robin's egg blue and I have this color throughout my entire house. The House Finch eggs and the American Robin eggs look exactly the same. 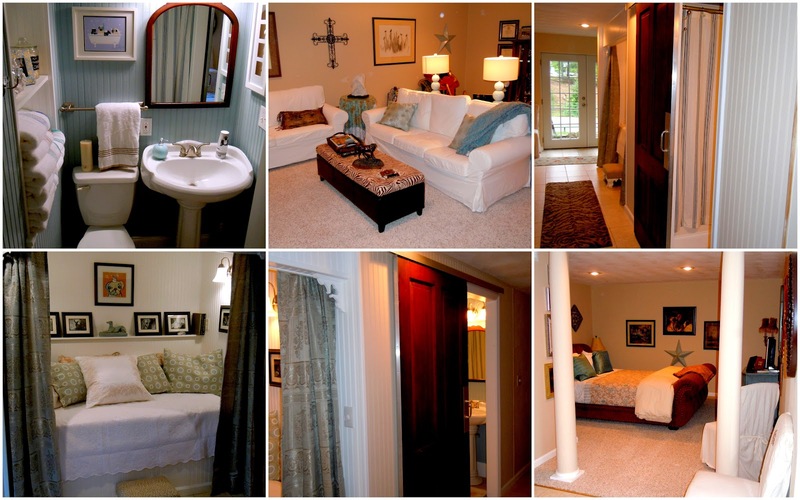 On a side note: Here is a photo of my last design project and as you can see, Robin's egg blue (as an accent color) is in every room! It gets even worse on the first floor of my farm house! Who Doesn't Love Robin's Egg Blue? Before: I wanted to show you what Mourning Doves should look like and how funny they look when they are bathing or cleaning thier feathers (see after photo). After: It looks like this Mourning Dove is having a bad hair day! Look at the pretty spots under her top feathers. One of many House Finch's that live here on Bluebird Farm. Look at his red colors. The males always have the bright red colors on thier head and breast. Here are the 2011 Canadian Geese and thier newest batch of goslings. This same pair had six little goslings last year and they didn't fly south until thier goslings were full grown. See the bottom of this post to see the young adult geese from last year. They are such good parents. They have three ponds to go back and fourth to each day and 12 different pastures to choose from for breakfast, lunch and dinner. Here are three out of the six young adults from last years batch. Over the next few days I wouldn't be surprised if the other three decide to show up here and have a family reunion. My dog bird dog Bailey watching the Canadian Geese....I'm surprised she isn't drooling in this photo!